Double down on your love of greens with a Big Bowl of Tuscan Greens. This recipe features romaine lettuce, Parmesan and Tuscan House Italian Dressing and couldn't be easier to make. 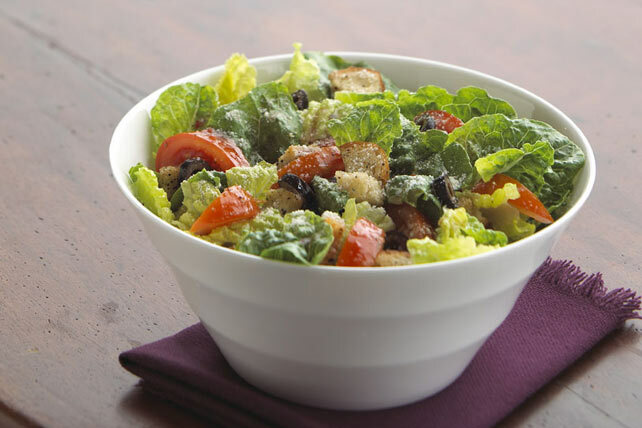 Toss lettuce, tomatoes and olives in large serving bowl. This salad makes a great accompaniment to lean grilled or baked meat, fish or poultry. Enhance the flavor of this salad by topping with a few pickled pepperoncini peppers. Prepare using 6 cups of your favorite torn salad greens.